Humba is a Visayan specialty. Similar to adobo, humba is something we got used to eating growing up. It's something for special occasions, and rare days only, because it tends to be more on the "unhealthy side". Usually made from pork belly, the fat in the pork gives the dish an added oomph and flavor. All the while I was thinking of humba and then later on realized I made adobo. To be honest, I can't tell the difference between the two! This recipe is something I got from Jen and tried out on a weekend just because I had been wanting to eat some. That, and because the smell of my housemate's adobo planted the craving in me. Yeah, yeah, blame the housemate, haha! 1. On a pan, put the dried bay leaves, pepper corn, vinegar, soy daice and pork. I opted to get the pork loin to be on the healthier side, but usually this dish uses pork belly. Simmer. Optionally, add hard-boiled eggs while it is simmering. 2. When the mixture reduces, add the pineapple juice. 3. Add water or a bit of sugar to taste and simmer for 5 minutes. 4. Serve hot, preferably with rice. 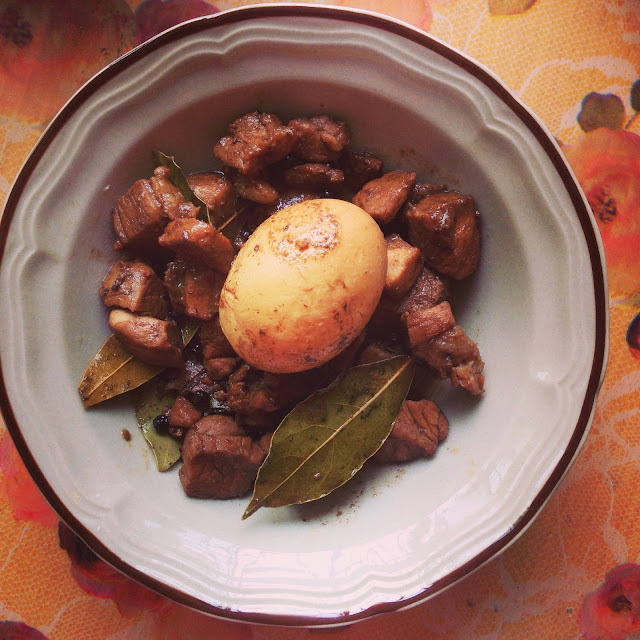 Pork adobo/Humba can be kept in the fridge for days. It's actually one of the dishes that tastes better when stored a bit longer as the sauce and flavor intensifies. Yum!